Signed: Case, dial, movement, and bracelet signed. Literature: For a similar example of a Rolex reference 6262 with exotic dial, please see Ultimate Rolex Daytona by Pucci Papaleo Editore, pp. 276-279. Carefully looked after by the original owner for nearly half a century, and then passed to his daughter, the current reference 6262 with beautifully preserved “Paul Newman” dial is a testament to one man’s impeccable taste and careful stewardship. 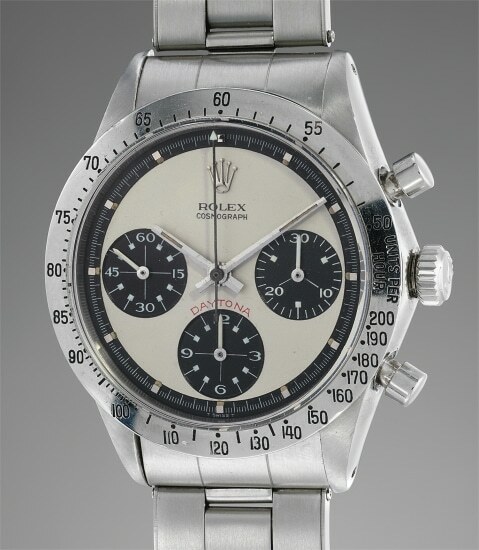 Rather than the tri-color dial often seen on references 6239 and 6241 as well as some references 6262 and 6264, this slightly later example boasts the coveted Paul Newman “Panda” dial, with a bi-color layout – the only red being the “Daytona” text above the hour counter. Together with reference 6264, fitted with a black acrylic bezel, the metal bezel reference 6262 was the last Rolex chronograph watch to be fitted with pump pushers. Reference 6240, 6263 and 6265 all feature water resistant screw down pushers. While aesthetically similar to its predecessor reference 6239, reference 6262 was fitted with the upgraded Valjoux movement caliber 727, replacing the previous caliber 722-1. One minor aesthetic difference can be found in the slight architectural redesign of the lugs on the 6262 versus the earlier 6239 – they are slightly more elongated. A finer example of an extremely rare reference, consigned by the daughter of the original owner, will be most difficult to find ever again. Case, dial, movement, and bracelet signed.